Steve Hubery is missing on Saturday. Hebburn Town boss Scott Oliver says he won’t change his team’s attacking style – despite seeing them throw away another lead in midweek. The Hornets missed the chance to top the Northern League Division One table after a 3-3 draw at Guisborough on Wednesday night. 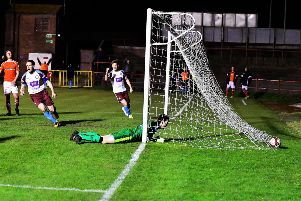 Oliver’s men had led 3-1 but were pegged back, Guisborough goalkeeper Jordan Nixon eventually scoring a 92nd-minute equaliser. Although they remain unbeaten ahead of their trip to Shildon tomorrow, Hebburn have now conceded 12 league goals this season, but Oliver says he isn’t worried. “To come away from Guisborough with a 3 3 draw was hard to take, we played well throughout and to concede a last minute goal that cost us our lead at the top was a body blow,” said Oliver. “We are going through a phase of late goals conceded but I’m not concerned – these moments happen in football. “The referee was poor all game and two key decisions went against us in the lead up to their goal. “I won’t be changing our style of play, we are great to watch and you have to give the opposition credit for their play sometimes. “We are unbeaten with not a lot wrong and have made a better start than I expected with so many new players. “Shildon on Saturday will be a cracking game and it is fantastic to go there knowing we have the players to win the game. Goalkeeper Steve Hubery misses through a holiday and Sam Taylor will replace him if Andrew Jennison’s international clearance does not come through on time. Defenders Jack Donaghy, Stu Bramley and Craig Malley are out while midfielders James Fairley and Andrew Stephenson are doubts with dead legs. Hebburn Town U18s progressed to the next round of the FA Youth Cup as they defeated Workington AFC U18s 2-1 at their Borough Park ground in the Preliminary Round of the competition. Goals from Ethan Donaghy and Andy Bowie gave the young Hornets a 2-0 lead, and although the home side pulled a goal back, Hebburn held on to make a little bit of history for the club. They will now host Carlisle United in the next round in a fortnight. Manager Kevin Carter said “It was a great night for the boys and the club overall, to travel and play like they have is a great achievement. “The lads played very well and it’s great to see the hard work we do on the training field coming off in matches.